Trophies awarded for Low Gross and Low Net scores. 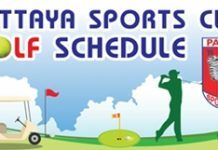 Entrance fee of 3,300 baht includes green fee, caddy fee, shirt, drinks, dinner with awards and prizes. Dek Dee Centre, Ban Chang, Rayong.